Joe Turner marked our fourth production, which brought a historical view of African Americans in the early nineteenth century. This production brought a professional quality of acting and technical operations that was appraised highly by all. We performed Joe Turner in three major venues, Cabrillo College, Louden Nelson, and Stevenson College. We had over two thousand theatergoers throughout the performance run. We were able to double our fundraising to maintain the existence of the scholarship fund and received numerous favorable revues from multiple newspaper critics. When Harold Loomis arrives at a black Pittsburgh boardinghouse after seven years' impressed labor on Joe Turner's chain gang, he is a free man—in body. But the scars of his enslavement and a sense of inescapable alienation oppress his spirit still, and the seemingly hospitable rooming house seethes with tension and distrust in the presence of this tormented stranger. Loomis is looking for the wife he left behind, believing that she can help him reclaim his old identity. But through his encounters with the other residents he begins to realize that what he really seeks is his rightful place in a new world—and it will take more than the skill of the local "People Finder" to discover it. . . .
On February 9th and 10th, Stevenson College will be privileged to house a production of Joe Turner’s Come and Gone performed by the African American Theater Arts Troupe. The play, by August Wilson, deals with the African-American search for individuality, spirituality, and purpose at the turn of the century in America. At the same time, the African-American Theater Arts Troupe is achieving this very purpose with this and their other productions. In a precedent-setting effort, this production will include actors from any parts of the community, and marks a major step in unifying the community with the Theatre Arts Troupe. Joe Turner’s Come and Gone is set in an industrialized area of Pittsburgh in 1911 at a black urban boarding house. It carries the audience through the joys and sorrows of the house’s newly freed slaves and their search for their own identity. These people, hoping for a piece of the "American Pie," often depend on their spiritual side to instill hope in their lives. "God has always played a major role in the African American life, since the gospels sung in the cotton field, embedding in them a hope for the future," said director Don Williams. The African-American Theater Arts Troupe, in it’s third year is giving residents and students of Santa Cruz what the Church did for the characters in Joe Turner: the troupe brings people from all the different areas together, in hope of creating a sense of community, identity and confidence. The troupe raises scholarship money for African-American students, strives to build unity and understanding in the community through it’s productions. "Part of our mission", Don Williams said "is to create a large net of fellowship, and community, uplifting people and giving them a greater appreciation for other cultures." Their goal of community is clear from their casting and performances. The cast of Joe Turner includes students from UCSC, Cabrillo College, and a local junior high school. He began to pray, as the members of his cast and others joined together in a circle around him. The strength of his voice rattled the room, yet the rhythm of the sound was positive enough to lift the sports of anyone in his presence. He directed the energy of the room towards the accomplishment of goals geared towards the production of a certain play. Whether the goal was acting, stage managing, designing costumes and props, or writing an article, he perceived it as part of the larger goal. The inspirational preachers was Don Williams, the creator of the African American Theater Arts Troupe (AATAT), and the play he prayed upon was Joe Turner’s Come and Gone. Set inside a boarding house in the industrialized North during the year 1911. August Wilson writes of the experience of various African American families at that time. It was described by one of the cast members as very realistic portrayal of African American families dealing with influences on the family structure. For example: many of the families had been separated by post slavery slavers such as the infamous Joe Turner and were forced to reestablish their connections to families as well as to the church. The importance Williams places on the pre-hearsal players are significant if not necessary for the production of Turner’s Come and Gone. It is a play filled with religious symbolism and a spiritual tone. "Joe Turner uproots Martha Pentecost’s husband and she finds herself waiting five years, five long years, for her husbands return," said Jennifer Vylasek of the character she portals in the play. "He doesn’t come back, so she goes out looking for him, leaving her baby behind. In doing that she finds the church, that’s where her strength comes from". The character Vylasek portrays is of a very strong black woman, which is a role Vylasek feels has enhanced her own character. Like many of the other students in the cast Vylasek has never performed before, but has dedicated her free time and energy into producing this shown because she is getting back almost as much as she puts in. The African American Theater Arts Troupe, not only performs a service to the community in the form of their performance, but it also creates a strong community of African Americans on campus who work together to achieve a common goal. This was just one part of Director Don William’s vision, when creating the troupe. "It cam to me that I saw a lot of students that were leaving the school, the University. There were tow major reasons why they were leaving," said Williams. "One, for financial reasons and two their wasn’t anything to maintain here, there was no real black experience that would cultivate them and make them feel a part of [the campus community]. We call this in today’s terms, retention." The African American Theater Arts Troupe was created in May ’92, with their first production of Ceremonies of Dark Old Men. This production raised $1,500 in scholarship money, which the Troupe used to establish the African American Scholarship Fund. These scholarships were awarded to several students who displayed need and outstanding excellence in any field. "The Troupes mission is to create unity, higher visibility of the African American community," said Williams. "And raise money, as the most important goal for the African American Scholarship Fund." The African American community Williams describes, does not stop at the base of campus, it spills out into the Santa Cruz community. James Porter is a twenty four year resident of Santa Cruz county and has joined the student cast to play the part of Harold Loomis, the lost husband of Martha Pentecost. This quarters cast consists of many old favorites and quite a few first time performers. Christy Humphry and Sharicce Rily are both new to the stage playing the character of Zonia Loomis. Tsadae Neway will catch the audience’s attention as Mattie Campbell. Dejuan Williams, although he will be performing with the Troupe for the first time, will look more than a little familiar to everyone. A few of the Troupe’s previous stars will shine again during this show. Lauren Smith, Edward Dorsey and Fitima Morris the cast from last springs rendition of Amen Corner appear again. The Streamers cast is back, Blake Riggs and the Santa Cruz celebrity Joshua Graham. And of course, the real old timer and president of the Troupe Eric Jackson will shine again. Porter said although the play is filled with spiritual symbolism which the audience would benefit from understanding, most importantly he was the audience "to be entertained, [because] that is as important as anything. If you come here and are not entertained, then everything else will lose its impact." On the opening night of August Wilson’s Joe Turner’s Come and Gone, a small crowd milled around the doors of the Stevenson Dining Hall with anticipation. Stevenson College preceptor Don Williams directed the production, and the UCSC African-American Theater Arts Troupe presented the play. Although the house remained far from full when the curtains opened, the performance was, by all definitions a first-class endeavor. 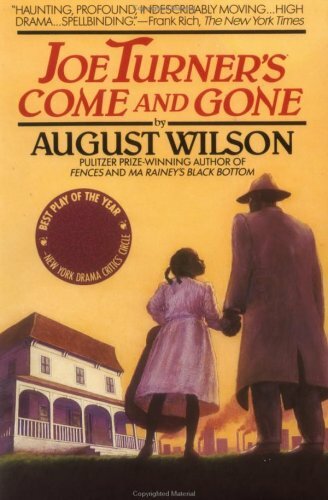 Joe turner’s Come and Gone, written by Pultzer Prize winner August Wilson, takes place in the early twentieth century in a Pitssburgh boarding house. Seth Holly (Eric Jackson) and his wife, Bertha (Lauren Smith), own the house and take in tenants on a regular basis. As the story develops, the Hollys rents a room to Harold Loomis (James Wellington Porter) and his daughter Zonia (Christy Humphry), who have been searching for Harold’s wife for four years. Other boarders in the house include the dynamic Bynum Walker (Joshua Bee Graham), Mattie Campbell (Tsadae Neway), who is searching for her husband, the flirtatious Molly Cunningham (Fitima M. Morris), and Jeremy Furlow (Blake Riggs), an irresponsible young play boy. The group dynamics that evolve from the interaction of these characters and the stories that each character has to tell lend an authenticity to the entire production. Graham steals his show with his energetic and powerful portrayal of Bynum Walker. He blends philosophical wisdom and quick wit to create a thoroughly entertaining and genuine performance. Eric Johnson turns in a straightforward and honest performance as the simple and hard - working Seth Holly. A highlight of the show is Zonia’s innocent romantic rendezvous with Reuben Mercer (Armond Edward Doresey), a neighborhood boy. Both Humphry and Dorsey bring realism and a child-like humor to Joe turner. Since the conception of the UCSC African-American Theater Arts Troupe in the winter of 1991, the organization has maintained a tradition of quality entertainment. The quality of productions has increased consistently due to donations from over thousand members of the Santa Cruz community. The troupe focuses on presenting plays with cultural significance for African-Americans and, in the process, attempts to educate about social issues through theater. The fall quarter production of David Rabe’s Streamers, also directed by Don Williams, was well received, and Joe Turner reaffirms the troupe’s dedication and the love that the actors and actresses have for their work. As Williams said, "African-Americans have been major contributors to all areas of American life. I want people to leave Joe Turner with the understanding that we all have God-given talents that can be enjoyed by everyone. "Joe Turner is a strong, exciting play"
There’s no doubt that a lot of the best theater that’s happening around here is occurring at UC Santa Cruz - often unheralded and little known to those of us outside of the campus proximity. The latest is another of those fine productions that you almost have to hunt for - an outstanding interpretation of a strong and exciting play. "Joe Turner’s Come and Gone" is being presented by the African-American Theater Arts Troupe and sponsored by the UCSC Theater Arts board and a number of other supporting organizations. The play is a dramatic example of how theater can bring history alive and make it vibrant and compelling without losing its ability to entertain and delight its audience. "Joe turner," written in 1978 by August Wilson, takes place in 1911 in Pittsburgh, Penn. The plot pulses around the central characters, a couple who amazingly true to its time, presenting its characters with unabashed honesty and no hint of apology. The impact is often unsettling. Director Don Williams has a fine insight into both the people and the time, and a fine cast to back up his vision. Williams develops accents with remarkable attention, and clearly understands the importance of his characters’ physical stance. More importantly, he is able to bring these qualities to the stage without any hint of condescension or awkwardness. His cast obviously appreciates the time frame they are working in, and they handle it very well. The three men who dominate the stage provide dynamic and impressive interpretations of their roles. Eric Jackson is warm yet ambivalent as Seth Holly, owner of the boarding house, able to handle his complex role with appropriate humility and understated pride. Joshua Bee Graham is a natural for the charming and important part of Bynum Walker - confident, enormously entertaining and quit capable of projecting the depth of his character without compromise. James Wellington Porter is outstanding as Joe Turner’s victim; he moves on the stage with smoldering rage and barely suppressed anger, and develops his character with impeccable care. His fine performance heightens the contrast he must present as the play unfolds. Lauren Smith is warm and comfortable as Bertha Holly, her strength cloaked in an appropriately subservient manner, and Ed Rosser is gruffly comfortable in the role of tinker and part-time finder of lost persons. The women’s roles, in keeping with the time, are less obviously strong - but that is part of the illusion. Tsadae Neway does a fine job as the subtly clever Mattie - she is both elegantly confident and demurely dependent, and manages to portray this ambivalence well. Fitima Morris, on the other hand, gives a similar persona a slightly different twist, and her development of Molly is robust and believable. Armond Edward Dorsey does an outstanding job as Reuben, a role that could have been lost to caricature but for Dorsey’s competent acting, and Christy Humphry plays the young Zonia with a perfect demeanor of obedience, her fearfulness and anxiety lightened in a few well-presented scenes of captured childhood. Blake Riggs is alternately smooth and nicely edgy as Jeremy, and Jennifer Nicole Vylasek is slightly anti-climatic as the long-awaited Martha. Set design by Michael Palumbo is excellent, a warm and comfortable replication of the period with fine attention to detail, and the early 20th century costumes by Eli Helmer are totally appropriate. "Joe Turner" is an insightful and yet thoroughly entertaining play. The historical time-frame is provocative but not demanding, and the story and characters develop with warmth and compassion. The use of mysticism and spiritually enhance the drama, and the result is an intriguing and fascinating look at a rarely portrayed time. Oh - and Joe Turner? You should be able to figure out who he is by the end of the play. UCSC’s African American Theater Arts Troupe explores a slice of urban black American life at the turn of the century with their rendition of Joe turner’s Come and Gone. Described as a creative showcase of history, the play will run at UCSC next month. Written by August Wilson, the play is set in 1911 Pittsburgh, a scene of great social upheaval. African Americans from the rural South migrated North to take advantage of better paying factory jobs. The characters, according to director Don Williams, come from very different backgrounds, but have one thing in common. "They’re trying to get a life, if you will," he said. "They want a piece of America’s pie." The play explores the interactions of the characters living in a black boarding house. The role of religion is very important in the lives of all the characters, and it serves to bring them closer together, said William’s. The character who brings them closer together is Bynam Walker, a witch doctor whom Williams calls "the bridge of all bridges/"
Joshua Bee Graham, who plays Bynam, said his character is a conjurer who literally binds other characters together. "The second part of the metaphor is that he serves as a bridge between North America and Africa, because he practices traditional ways of healing," said Graham, a third year Kresge Student. James Porter, a 49-yeer old electrical technician, plays the part of Harold Loomis, a central character in the Play. Porter said the character Loomis is "a possessed person." Loomis spends of the play searching for the wife he lost when was illegally kidnapped into slavery. "He’s spent all these years waiting to start his life," Porter said. As the play continues, Bynam helps Loomis with his search. "He [Bynam] sees me [Loomis] through things, he can almost read my thoughts," Porter said. As the play reveals people from different backgrounds coming together, Williams said the theater group’s mission is also to create unity, and heighten visibility and understanding of the African American community. As Part of this effort, Cabrillo College reduced the facilities cost for the troupe so they can appear there for the first time, "We are really happy to have the group perform here," said Wilma Marcus Chandler, the troupe’s faculty sponsors at Cabrillo. "Our function as a community college is to draw attention to things that wouldn’t ordinarily be seen," she said. "We’re always willing to umbrella a worthy group." Proceeds from the African American Theater Arts Troupe’s performances go towards three $1,000 scholarships which are given out annually. One goes to an African-American student involved in theater arts and the other two go to students in good academic standing who have demonstrated financial need. Williams said the troupe also works to heighten the awareness of the African-American community within UCSC. This partially the reason that all the troupe’s rehearsals are held at the Stevenson College which has a low ratio of African American students, "rather than Oakes or something," said Williams, who is also preceptor at Stevenson. "Stevenson is making great strides toward appreciating diversified environment," Williams said. "The student council helps us financially, and the overwhelming turnout of Stevenson residents that support our performances gives me great joy." This year’s production of August Wilson’s play "Joe Turner’s Com and Gone" by the African American Theater Arts Troupe proved, without a doubt, that the troupe has blossomed into an artistic driving force on the UCSC campus, and the Santa Cruz community. The troupe, headed by Don Williams who directed the play, has given its most memorable performance to date. While the majority of the troupe is made up of students whose interest vary from the sciences to politics, their collective performance was not short of perfect. Eric Jackson and Laura Smith. Who play She and Bertha Holly, give wonderful performances as the husband and wife who rent out rooms to the other characters, including Harold Loomis, played by James Wellington Porter. The story revolves around Loomis who is looking for his wife Martha. Along with his daughter Zonia, played by Christy Humphry and Charisse Winguard, Loomis meets the rest of the cat at the Holly House. He is completely enslaved by his search of love that no longer exists. It isn’t until he finds this love that he is capable of continuing with his life. Zonia Loomis is caught in the middle of her father’s rut. While at the Holly house, she meets Reuben Mercer, played by Armond Edward Dorsey and Dejuan Williams. Reuben ends up falling for Zonia, who has not received any love from either parent. She, in essence, finds what her father had and can’t let go of. Fitima Mariama Morris gives the most refreshing performance as she transforms the intellectual and liberated character of Molly Cunningham into a show stopping force of wit and wisdom with her genuine spark and sensuality. Not only does Cunningham chop up Forlow and his advances, but she also manages to set Campbell straight just by being herself. The most emotional performances was given by Jennifer Vylasek, who played Marth Pentecost, as she is re-united with her husband and daughter. Vylasek moved the audience nearly to tears as she explained that she did not in fact abandon her daughter but has been searching for her. This years Troupe hosted several people outside of the university. Dejuan Antonio Williams and Charisse Winguard are both 14 years old and students at Westlake Elementary School and Mission Junior High, respectively. Ed Rosser is currently a student at Cabrillo College. His portrayal of Rutherford Selig, the man who finds Martha Pentecost, was at times humorous and cynical. James Wellington Porter is currently pursuing a career on stage and in film. As Harold Loomis, Porter is currently pursuing a career on stage and in film and gives a spine chilling performance as the man trapped by the past. Sometimes it’s funny, sometimes dramatic. It has deep spiritual moments and it’s sexually charged. Its action can be sluggish or snappy. But it always has a deeper tension. It is the African-American Theater Arts Troupe production of Joe Turner’s Come and Gone. Written by Pulitzer Prize winner August Wilson, the play is both a story about individuals and a metaphor for aspects of the African American experience. Set in Pittsburgh, 1911, the story unfolds in a rooming house that’s the home of Set Holly (Eric Jackson) and his wife Bertha(Lauren Smith). Seth is an honest, hard-working, down-t-earth metalworker supplementing his income by providing room and board to a divers collection of characters, including Bynum Wlaker (Joshua Bee Graham), a philosopher expressing a mixture of Christina Spiritualism and juju magic, and Keremy Furlow (Blacke Riggs), a shallow laborer interested only in drink, women, and song. Into this collection wander Harold Loomis (James Wllington Porter) and his daughter Zonia (Charisse Winguard). Harold is a slow, simple main, almost empty but for a deep core of anger and loss. With a brooding intensity, he is looking for the wife he was separated from ten years earlier. But then, nearly everyone is searching for something in this play. Seth wants backing to begin a metal shop of his own. Bynum is looking for revelation in the form of the "shiny man," someone touched by Holy Spirit. Jeremy is looking for a good time. So is Molly Cunningham (Jennifer Nicole Vylasek), a late addition to the household with a cynical attitude about men. Mattie Campbell (Tsadae Nweay), another late addition, is looking for a secure relationship. On its surface the play seems straightforward, the characters simple. But it is rich in meaning relevant to the African-American experience. Its characters are seeking people who represent respect, security, happiness and heritage. Ironically, the man some turn to, people-finder Rutherford Selig (Ed Rosser), comes from a family that hunted escaped slaves. The production is powerful and well played. The performers are in tune with their characters, making them believable people rather than roles for actors. The play needs reflection to fully appreciate, however. It is sometimes slow and too deep to interpret easily. But the essence of the African-American culture’s quest for identity is captured in Joe Turner’s Come and Gone. The first rave review I have for you people is for "Joe Turner’s Come and Gone", written by August Wilson, directed by Don Williams, and put on by the UCSC African American Theater Arts Troupe. Taking place near the turn of the century in a Pittsburgh boarding house, the play tells the story of the effects of forced servitude, redemption, spirituality, and fining oneself. The cast is full of memorable character, but my favorites included Bynum Walker, played by Joshua Bee Graham and Seth Holly, played by Eric Jackson. James Weller Porter does an incredible job making Harold Loomis and effective and convincing character through the play.